Apple released the first Apple TV set top box in 2007 calling it a 'hobby' device and wanted to see what customers would do with it. I've recently upgraded to a new iOS powered Apple TV third generation to watch TV shows and movies on my living room TV. My first generation Apple TV is now connected the TV in my girl's room. They don't have a cable box so this gives them a way to watch TV shows and movies that my wife and I can monitor. But the first generation Apple TV was released in a time before 1080p and there is lots of HD content in the iTunes Store now. I recently ran into a problem where a late episode of Discovery's Mythbusters. Regardless of what I tried, the episode wouldn't sync. Naturally, I ran to Google.com and started searching for answers. Then I realized that the episode was only showing an "HD" icon, and not the "HD SD" icon. SD being "standard definition," the 720p version of the show that the original Apple TV can play. And there was my light bulb moment. When I purchased the episode, I purchased the HD version to watch on my MacBook Pro or my living room third generation Apple TV. I needed the SD version so my kids could watch it in their room. Aha! Once I downloaded the SD version of the shows, the episodes synced up to the first generation Apple TV normally. So the lesson that I learned here is when you are purchasing HD content and you plan to use it on a first generation Apple TV make sure you go back and download the SD version of the show or movie if it doesn't automatically download. 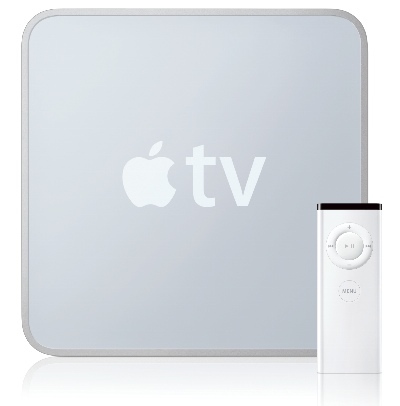 To learn more about the Apple TV, in all it's versions, check out the Apple TV Wikipedia page.